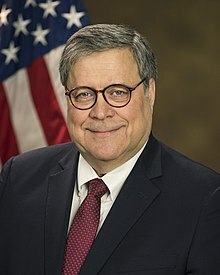 William Pelham "Bill" Barr (born May 23, 1950) is an American attorney. He is the 85th and current Attorney General of the United States since February 14, 2019 under the Donald Trump presidency. Before, he was the 77th Attorney General under the George H. W. Bush presidency from 1991 to 1993. On December 7, 2018, President Donald Trump announced that he would nominate Barr to again serve as Attorney General of the United States. He was confirmed, for a second time, as Attorney General on February 14, 2019, and assumed office later the same day. ↑ Barrett, Paul, "Bush Picks Barr for Attorney General Post", The Wall Street Journal, October 17, 1991, page A25. ↑ Kirkland & Ellis LLP, Former Attorney General and Verizon General Counsel Joins Kirkland & Ellis LLP (press release). January 7, 2009. ↑ "Trump Says He Has Chosen William Barr to Be Next Attorney General". Wall Street Journal. December 7, 2018. ↑ Trump, Donald J. (2018-12-07). "I am pleased to announce that I will be nominating The Honorable William P. Barr for the position of Attorney General of the United States. As the former AG for George H.W. Bush..." @realDonaldTrump. Retrieved 2018-12-07. This page was last changed on 18 February 2019, at 09:04.